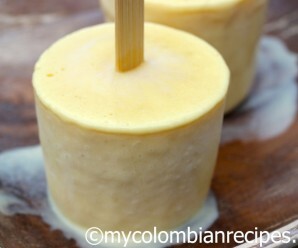 Esponjados are traditional desserts in Colombia. There are a lot of variations including coffee, lulo, lime, lemon and orange. Maracuya is a delicious exotic fruit from South America but it’s grown in many countries around the world such as India, Africa, Israel and the United States. I love the combo of tanginess from the passion fruit and sweetness from the condensed milk in this dessert. Use crumbled graham crackers or whipped cream as toppings. In a small pot add the water and gelatin. Over medium heat let it cook for about 2 minutes or until the gelatin dissolves. Place the passion fruit puree and condensed milk in a blender and blend for about 2 minutes. Add the dissolved gelatin to the blender and blend for 1 more minute. In a medium bowl, using an electric mixer beat the heavy cream for about 3 minutes. Fold the whipped cream into the passion fruit mixture. Spoon the mixture into individual serving glasses or bowls and refrigerate for about 5 hours or overnight. 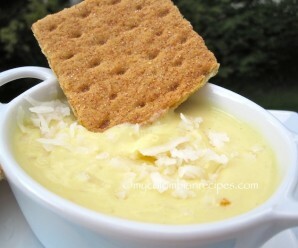 Serve with whipped cream or chopped graham crackers on top. Oh it looks wonderful Erica!!!! I’d love to try this passion fruit version, looks yummy! Wow! This looks just amazing and sinful. sweet heaven, that looks so good! I’ve had this or something like it before, cannot remember the name but it was GOOD! Can’t wait to try this! 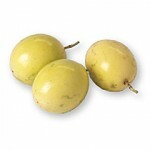 it looks and sounds delicioso, in the Dominican Republic we call passion fruit, chinola. love sandra g.
How delicious! I love the flavor of passion fruit! The crumbled graham cookies are a great topping! MMMMMMMMM,…this dessert looks quite fabulous!! I would like to digg in right now!! Oh dear, I would love to have this right now….yum! Mmm, I love this dessert! The topping looks delicious too! I have not found passion fruit this year:-( This is such a decadent dessert. Where do you get the passion fruit puree? can you use frozen pulp instead? C- You can use frozen pulp. Erica made this this yesterday, I love them! and my husband loved them too! 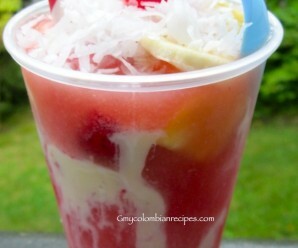 I made this with frozen pulpa. OMG! delicious! My husband, who hates the texture of puddings/custards, nearly licked the bowl clean. He claims it tastes even better than key lime and I must agree.